On a blustery February day, Marvin Brenzo, 66, of Norwalk decided to use his snow blower to clear his driveway – giving a break to his wife, Judy, who had just cleaned off their sidewalk. Marvin started to have trouble catching his breath which he attributed to the cold, brisk air. He came inside for a while, sitting in his favorite recliner in the living room while Judy was in the kitchen doing dishes. After a few moments, Judy turned to check on her husband and noticed he was unresponsive in the chair. Judy sprang to action calling 9-1-1 and performed CPR on her husband until the Norwalk Fire Department first responders arrived to take over from Judy and continue basic life support. Judy said she learned CPR from her previous job in a local factory. North Central EMS arrived on the scene and provided advanced life support including defibrillation to shock the heart and medication to help stabilize Marvin for transport. Marvin was taken to his local hospital but because of the severity of his situation they were unable to treat him. He was then going to be sent to a Cleveland-based hospital via medical helicopter. Because of unfavorable weather conditions, the medical helicopter was unable to take off and Marvin was brought to Firelands Regional Medical Center via North Central EMS (NCEMS). At this point, timely travel by NCEMS and a quick response at the receiving hospital were critically important to Marvin’s survival and ability to recover. 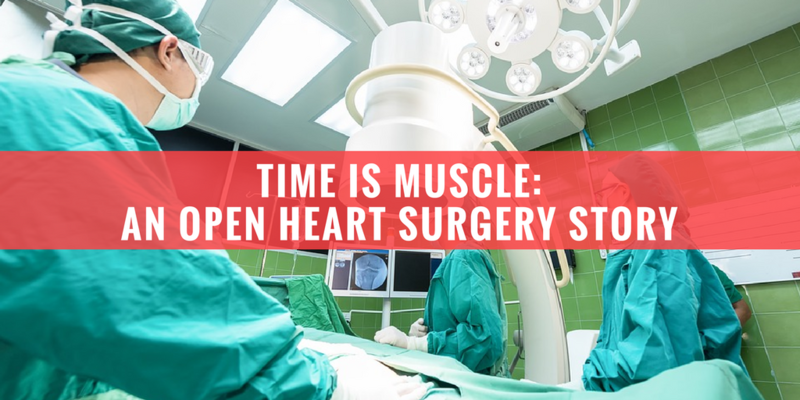 National experts in cardiac care continually emphasize “Time is Muscle,” indicating that this quick response is necessary to prevent permanent damage to the patient’s heart muscle. Marvin was taken to the cardiac catheterization lab at Firelands Regional Medical Center where Scott Sheldon, DO, interventional cardiologist with North Ohio Heart, and the heart team performed a heart cath within minutes of arrival that showed Marvin’s arteries were so blocked that he needed open heart surgery. Dr. Sheldon developed a plan of care and Marvin was sent to the cardiac care unit where his plan of care continued until he was stable enough to have open heart bypass surgery. 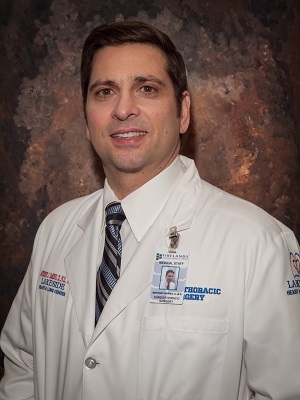 According to Anthony DeRiso, MD, a cardiothoracic surgeon with Lakeside Heart and Lung, the care team, which included cardiology, cardiac surgery, neurology, pulmonology, nephrology, perfusionists, laboratory and radiology technologists, delivered comprehensive care, including a cooling protocol, to support Marvin’s vital functions and allow the body to rest and stabilize to be strong enough to withstand the needed quadruple bypass surgery. After the long period of CPR that had been needed to save Marvin’s life at the time of heart attack, a cooling protocol is the component of care which allows the brain to slow down and heal. “We all kept a close eye on him,” Dr. DeRiso said of Marvin. Marvin’s heart was soon stable and though still in critical condition, he was strong enough for open heart bypass surgery. Once he was in the operating room and anesthesia was administered, the situation changed. During the open heart bypass surgery, Marvin’s heart stopped and the heart team switched into emergency mode. Members of the heart team immediately began CPR and between compressions, Dr. DeRiso began to open Marvin’s chest for surgery. “We finally got Marvin opened, our surgical assistant was manually squeezing the heart while I hooked up Marvin to the bypass machine that would continue to pump blood and oxygen to the body during the procedure,” said Dr. DeRiso. The open heart bypass surgery went extremely well and to date, Marvin has not had any adverse effects from his surgery. Dexter Alexander, surgical assistant and cardiothoracic service area coordinator, said Marvin’s situation provided a bond for him and the Brenzos. While Marvin was in the hospital, Dexter, who is an artist in his off hours, drew a picture of Abby on a pillow that all heart patients are given. Patients use the pillows to support their chest incision as they cough or move around during the early days of the healing process. Marvin and Judy said they were both extremely happy with the care Marvin received while at Firelands Regional Medical Center. Learn more about open heart surgery at Firelands Regional Medical Center today.